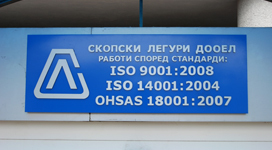 Skopski Leguri DOOEL is a fast-paced and dynamic Macedonian ferroalloy manufacturer. Furthermore, Skopski Leguri is a key exporter of ferroalloy products to the European Union, Balkans, USA, Turkey and Middle East countries. This modern, vertical integrated, export oriented enterprise has a huge potential production. Due to the long experience of operating at the metallurgic market as well as the high quality production, the enterprise has gained a reputation of the reliable partner meeting the requirements of customers. The enterprise’s core specialization is a production of manganese ferroalloys. Our products are applied in the metallurgic industry for the alloyage, deoxidation, steel and alloy doping as well as for the welding electrode manufacturing. Today Skopski Leguri gathers momentum, constantly ramping up production and enhancing the variety of products. Our dynamic development is stipulated by the strong technological management process performing with the accurate measuring and control equipment, highly-qualified staff as well as the company’s flexibility in framework of the constantly changing market.